Psychometrics is the theory or technique of mental measurement. In educational testing, it encompasses the family of methods and mathematical models used to measure student aptitudes and proficiencies. 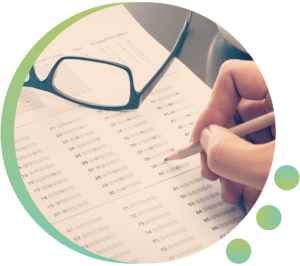 The simple way to record test results is with “raw scores,” or the number and percent of items a student gets correct on a test. But there’s a major problem with raw scores: They don’t behave like the measures you would get from, say, a yardstick. We use yardsticks to measure physical distances. In order to understand and get meaning out of different measurements, everyone’s yardstick needs to be the same. If we use raw scores to measure student ability and try to get meaning out the measurements, each unit of measure needs to be the same, but they’re not. Why? First, the increments between raw scores are not evenly spaced. The inherent difficulty of gaining one more percentage point changes as you approach 100 percent. Second, raw scores don’t translate across different tests. A 70 percent correct on one test rarely has the same meaning as a 70 percent correct on another test. Certain test items are more difficult than others, and there are subtleties about those items that also need to be measured. The Psychometric testing models we use let us “slice and dice” these components, measure and equate the different parts, and analyze test data with great rigor—making psychometrics the heart and lifeblood of educational assessment. Educational Data Systems specializes in psychometrics to measure student achievement. We utilize a wide array of models and statistics, specializing in the Rasch family of psychometric models. Our precision scaling services place students on reliable, linear measurement scales. Rasch Models provide a methodology for producing “objective” measures (student scores that will reproduce from test to test). They are also useful in test equating (getting the results from one test to be comparable to those from another test), and in making sure that test items are fair and definitive. Test equating ultimately involves psychometrically linking many different tests together so that they behave like one large, cohesive test. This enables us to put all students who take equated tests on the same measurement scale, even if they took different tests. From tests to studies to surveys, psychometric assessment tools can be used to develop, validate, analyze, interpret, and optimize a variety of items. Our team takes pride in its ability to extract clear truths from complicated data in the form of simple graphs and tables that tell the story. For the more detail-oriented, we also produce thorough and comprehensive technical reports. Looking for more psychometric assessment resources?